Located in downtown Portland, the Cumberland Club occupies the historic, Federal-style Stephan McLellan Mansion. Built in 1802, the building has received at least six major campaigns of additions, including renovation designed by John Calvin Stevens. B+W’s involvement with the Cumberland Club began with a master plan to study conditions, accessibility and expansion needs to all three stories for the 130-year old social club. 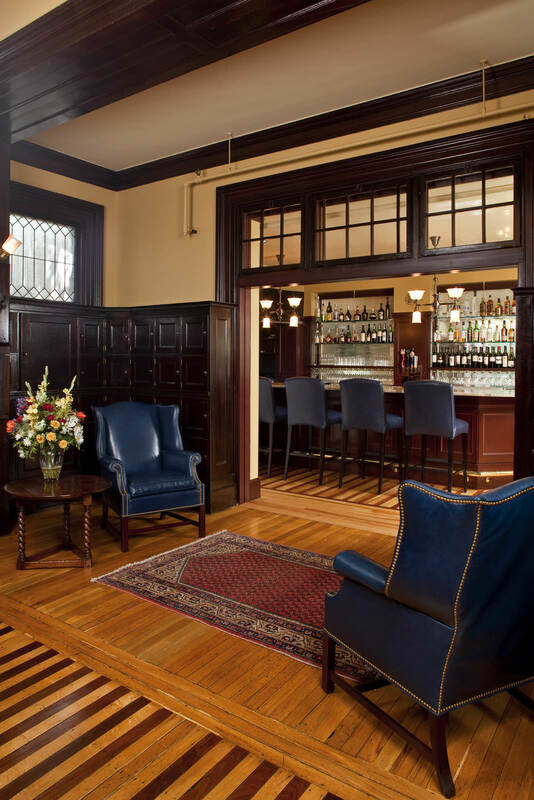 Steeped in history, the Club was also looking to update its staid image with a new gathering space central to the operations: a bar that was traditional in style, complementary to the Maine Room and yet, innovative enough to set a tone to revitalize membership. In the master plan, B+W established that the bar’s location would be adjacent to the Maine Room, in what once was a dining terrace with French doors. 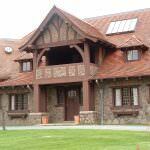 Later additions and remodeling had enclosed the space and hidden its character. The new bar transforms the once-tired interior into a comfortable, wood-lined extension of its adjacent room. A key challenge overcome in the planning was the design of the back bar, which integrated a sophisticated set of kitchen/bar equipment in a limited amount of space. Two different species of wood were selected for the striped floor for their inherent characteristics to allow for a one-step process of clear finish. The granite countertop picked up the tonal quality of the room in a permanent and utilitarian surface. The German-made glass is transparent enough to allow views out from the room to a hint of the green landscape beyond, but translucent to disguise the identity of nearby diners. The leading pattern is modeled on the historic windows in the Maine Room. Daylight filters in through the glass wall illuminating the bottles; concealed specialty lighting augments the natural light and provides a sparkle. Scope also included furnishings and fabric selection. The Bar’s name honors Maine native, former Governor, Civil War general and Club member, Joshua Chamberlain.